I love classic dishes and the comfort they bring. But I also love to go “off the grid” with my meals a bit as well. It helps keep it interesting. I found a version of this dish on a hunt for mushroom recipes. My daughter has an obsession with mushrooms and I like to encourage things like that. For one thing it’s a healthy versatile ingredient, so why not indulge her passion? But more importantly, food is a universal expression of love – I truly believe this. I can show my family love not only by cooking for them, but by making things they love to eat. Crostini means “little toasts” in Italian. This recipe is really just toast with a mushroom topping. It’s easy, comforting, and of course delicious. 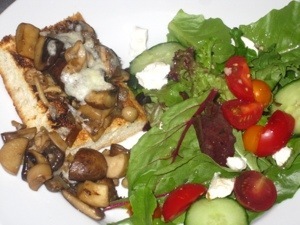 The sherry vinegar gives a nice sweet & savory compliment to the meatiness of the mushrooms. The thyme adds woodiness and fresh lemony flavor. The cheese adds salty creaminess. Combine all that with the crunch and texture from the bread and how could you not inhale this recipe? I make this for dinner a lot, but it’s also a great appetizer! Just use a baguette for smaller slices. You are welcome to use whatever your favorite bread/toast is. Focaccia is baked more flat than in loaf form. It is actually pizza dough made into bread. Often it will have things baked into the top such as rosemary, sea salt, onions, etc. I like to use these instead of the white button mushrooms. Criminis are just baby portabellas. Their flavor is milder than the grown-up version, but they add that great meatiness. I’ve seen a lot of exotic mushroom medleys for sale in produce sections lately. McKenna and I like to use shitakes, oyster and trumpet mushrooms for this. But if you aren’t too into the exotic thing, just get more crimini or white ones. The thyme has a lemony and piney flavor that will not only bring freshness but also will help bring out the woodiness of the mushrooms. If you don’t have shallots on hand use ½ of any onion. Shallots have a stronger flavor than onion but seem to have less bite. Add as much garlic as you like. I add one for this recipe as I like it to be more of an aromatic than a star flavor. If you don’t do butter then just sub with oil. This will add astringency, creaminess and tartness to the dish all at once. In a pinch, actual sherry will work as well as balsamic or red wine vinegar. Manchego is a Spanish sheep’s milk cheese. It is very creamy but also mild. It’s less salty than but similar to Parmesan. A good substitute would be Pecorino Romano. Trader Joe’s is the best place to buy good cheese at good prices. I always buy the highest quality cheese. Nothing really good ever says “diet” or “reduced” on the package. And because it is high quality you need so much less. Believe it or not I have found it is actually CHEAPER to buy cheese this way. Turn on broiler. Cut the focaccia bread into 4 squares. Then cut horizontally through the middle (like you are cutting open a hamburger bun). Lie each piece, face up, on a baking sheet. Use 1 tablespoon of olive oil to drizzle on the tops of the bread. Set aside. Remove stems from mushrooms. Slice tops into larger slices. Set aside. You don’t actually have to remove the crimini stems. I like to do it when I use shitakes or any other mushrooms whose stems are kind of woody. It’s your call. We don’t want to chop the mushrooms up too small as they will greatly reduce when cooking. Trust me – it will seem like too many when you start to cook but it will be a lot less when they are ready to eat. Peel and mince your shallots. Peel and mince garlic. Warm a large skillet over medium heat. Melt butter and heat remaining olive oil. Add in shallots. Let cook until translucent, about 5 minutes. Add in garlic, thyme and mushrooms. Add a pinch of salt and stir. All we are doing with the shallots is sweating them. This gets them to release their sugars, flavor and aromas. We add in the garlic with the mushrooms as they will protect it from burning. Garlic can burn easily and will get very bitter. One of the great things about thyme is its delicate leaves. All you have to do is toss the stems in whole into the pan. The heat will wilt the leaves right off. And when you’re done just pull the stems back out. Use the biggest skillet or pan you have for this. It’s just like in Julie & Julia: if you crowd the mushrooms, they don’t brown. Let mushrooms cook for about 5 minutes, stirring frequently. Add in sherry vinegar, stock & thyme and stir. Let cook until liquid is absorbed and mushrooms have browned. Remove sprigs of thyme. At this point the mushrooms are absorbing all the flavor you have added to the pan. They are softening and reducing. Put bread under broiler for about 8 to 10 minutes, until golden brown and toasted. This will kind of depend on your oven. Just don’t forget it’s in there and you’ll be fine. You can also use your toaster oven for more control. Top each slice evenly with mushrooms. Sprinkle desired amount of cheese. Put back under broiler for about 2 minutes. All we’re doing here is melting the cheese. Everything else is ready. Thank you so much for visiting me this week! I hope you try this and/or any of my recipes. And if mine don’t work for you then find some that do. Just try to do what you can. It’s pretty hard to completely change overnight. If you are just starting out, take baby steps – eventually you will get there. Try just cooking one time a week and increase as you go. And I am always here, happy to help answer any questions you have. Thank you for reading my recipe! I will also include a printable version of this recipe without all my witty repartee (ha-ha!). I hope you enjoyed it enough to try it!